Scotland is believed to be, by almost all of Scotland I imagine, the best ‘wee’ country in the world. I realize I may be biased saying that as obviously I am born and raised Scottish. Scotland is a very cultural, scenic and historical country. We have preserved almost all of our old castles, monuments, statues, streets, buildings and centers. You’ll find a lengthy history to any place you go in Scotland. Like America, Scotland is extremely patriotic and we are all very proud of where we come from – even if it does rain a lot. The thing about the rain though, and why it’s hard to hate, is because the rain is the reason behind why we have such a scenic country. 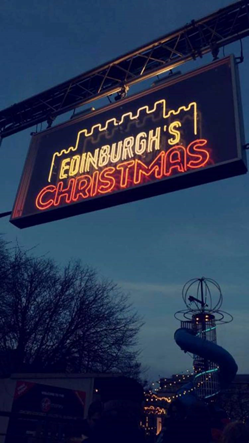 The entrance to the Edinburgh Christmas Markets. Scotland is one of the most luscious and green places you will ever see. The views are breathtaking. Another reason we don’t mind the rain is because, once it stops we either have the most glorious sunshine or a beautiful layer of snow. You don’t know fun until you sledge and snow ball fight your way to school every day! A view of The Wallace Monument in Stirling. Whether you are into old classics or up and coming music, Scotland has the music scene for you. Traditional Scottish ceilidh music can put anyone in the mood for dancing! On the other hand, a lot of the big name DJ’s in Europe right now are Scottish. Calvin Harris for example, last year, was the world’s highest earning DJ worldwide. Glasgow’s Argyle Street in the summer. If you are looking for a bit of magic and mystery in your life I would recommend coming to Scotland. Can you think of any other country, which has not one, not two, but three famous mythical creatures? Yes, it is true the national animal of Scotland is a unicorn and, yes, we have a unicorn on our passport. I can confirm that we do in fact have a Loch (lake, to put it simpler) Ness and I cannot confirm nor deny that the Loch Ness Monster exists. You’ll just have to go yourself to find out. In regards to all this, J.K. Rowling is Scottish, and did write all the very famous Harry Potter series in a cafe in Edinburgh (that you can visit), but she must have got all these magic and mystical ideas from somewhere? A view of the Glasgow Clyde River from ‘The Tall Ship’ next to The Glasgow Transport Museum. We do indeed all eat haggis, and we love it! Haggis is a delicacy and the only people that don’t like it are the ones who haven’t tried it. We also brew the best whiskey in the entire world and to get the proper experience, you have to drink it in Scotland. Any Parks and Recreation fans out there? Just ask Ron Swanson. One thing I can fully, hand on heart, confirm is that Scotland has the best nightlife. Everyone in the pubs, clubs and bars love to meet new people and wants to have a good time and a good night. No one in Scotland ever turns down a night out. Glasgow’s famous Sauchiehall Street or ‘The Style Mile’ of shops, decorated at Christmas. Without even realizing it, so many of your favorite celebrities are Scottish! J.K. Rowling, Calvin Harris, Obi Wan Kenobi or as we know him - Ewan McGregor, Doctor Who - otherwise known as David Tennant, Gerard Butler, Gordon Ramsay, Tilda Swinton, Richard Madden, Craig Ferguson, Sam Heughan, Annie Lennox, Sean Connery, James McAvoy, Andy Murray, Alex Ferguson, Chris Hoy, the list is endless. That’s one of the best things about Scotland, you can see it all! It’s also very cheap, quick and easy to travel to the rest of the UK and Europe! Got a weekend off? Go and explore, you’ll find your heart stays in Scotland though. Glasgow Rooftops. A view from ‘The Lighthouse’ – Scotland’s center for Design and Architecture. The ultimate best thing about Scotland is the people! Scottish people are second to none; everyone in their own way is a comedian. You will meet some of the funniest people you ever come across, (Have you not heard of Scottish Twitter?). The people are friendly, welcoming, hospitable, generous and all around lovely. Every day you leave the house you’ll make a new friend, being a small country, we continue to have very traditional mannerisms and values. If you walk past someone in the street you have to acknowledge them, with a nod, a smile or a hello. It will make your day! I can guarantee you’ll love Scotland and will have the time of your life. Doing a semester abroad in Scotland is a decision you’ll never regret. Don’t forget to pack your warm clothes though, it’s going to be chilly!